This 24oz, 18/8 Stainless Steel, Vacuum Insulated Travel Mug keeps your drink hot or cold for hours. 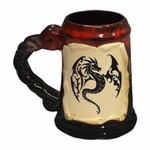 It features the amazing dragon artwork of artist Amy Brown. It is Cup Holder Friendly, has an Ergonomic Grip, doesn't need a coaster, and has a Lifetime Guarantee!